I wasn't actually going to blog about my haircut as it gave me a slight feeling of déja-vu looking at my last hair post (so crazy looking back at these photos! ), but seeing as I ended up having quite a lot done I thought it would be nice to talk about it for any of you wondering. First of all, it's short. I really needed a haircut there's no doubt about it, I think it was becoming all too obvious in my photos; my hair just wasn't happy and it showed. I always do this where I let my hair grow super long and then end up getting it cut too short, not liking it and then letting it grow out again until I sit at the hairdressers chair once again and hate the outcome - it's a vicious circle! I'd love to say this time was different but I don't think it was.. I'm still getting used to the length and the added layers - the hairdresser said my hair was really boring. Having said that, I'm not too displeased with the look I just need to get used to styling it and I had become so lazy with my hair when it was long that it's come as a shock. I saw Hey Claire went for the chop and she looks bloody amazing so I'm hoping I can recreate her waves and get used to my new look. 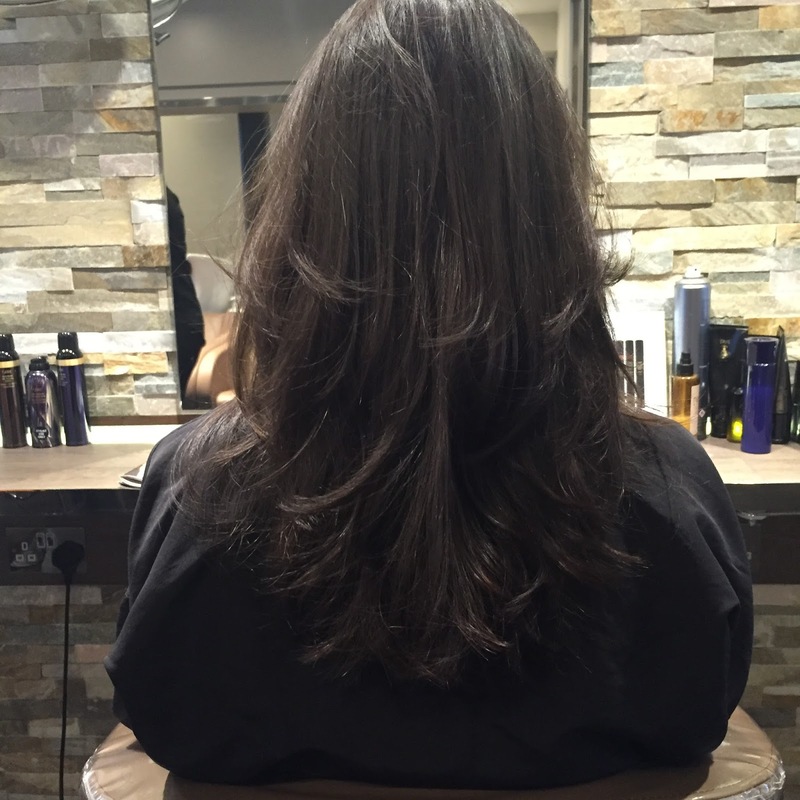 I went to RYS Hair and Beauty salon which was tucked away in South Kensington, a small but really gorgeous salon. There was a mix up with my appointment time but the people at RYS were really lovely about it and offered me a collagen hair treatment while I waited. It was a fairly new treatment to their salon, from Italy, which basically works to seal in the broken particles of your hair and give you stronger hair. I can't fault the results, my hair is super soft and I even think that would have been enough of an excuse for me to keep my hair long for longer. I also, got a cut and blowdry (see the salon results on Instagram). All of this thanks to an app called Ruuby. Ruuby allows you to pick and choose what you would like to do, where and when - you can book appointments on the day or weeks in advance. They offer so many services from manicures to massages and even at home treatments! It's super easy to use and one of my favourite things about it is that you can discover new locations as well as find out prices and pay for your treatments through the app - it just adds that extra bit of luxury when you can leave a salon after your treatment and not worry about having to pay (perfect for after a manicure! I think getting out my card after a mani is the scariest thing haha) You can download the Ruuby app here. Sorry this was such a long post! I wish I had taken my camera along with me to the salon but carrying around my big DSLR (Canon 700D) isn't really appealing - the Olympus PEN is on my wishlist!